Who is a candidate for asthma medication? What are controller medications for asthma (long-term control)? What are rescue medications for asthma (short-term control)? What are the different forms of medications (pills, inhalers, nebulizers) to treat asthma? What are the specific controller medications for asthma? What are over-the-counter (OTC) asthma medications? What are asthma medication guidelines? What are the potential risks and side effects of drugs used to treat asthma? What are the various kinds of asthma medications for toddlers and children? What kinds of asthma medications are safe to use in pregnancy? Any patient who has a diagnosis of asthma is a candidate for an asthma medication. Patients with mild, infrequent asthma symptoms may only need a short-acting rescue medication to use when needed, such as albuterol (Ventolin HFA, Proventil-HFA, Vospire ER, ProAir HFA, ProAir, RespiClick). Patients with more frequent and persistent asthma symptoms are candidates for daily medications. The choice of medication will depend on the severity of the asthma. A controller medication is a daily medication that is used to prevent or improve asthma symptoms in patients who experience frequent symptoms. The decision to use a controller medication for a patient with asthma is based on the frequency and type of daytime or nighttime symptoms, frequency of medical visits for asthma, frequency of requiring asthma rescue medications, frequency of oral steroid use, impact of asthma symptoms on daily life, and breathing tests for asthma, which are performed in the medical office. In patients requiring controller medications, inhaled corticosteroids are generally considered as the first-line therapy for asthma. A rescue medication for asthma is a medication that works within minutes to open the airways (bronchodilate) and provides quick relief from asthma symptoms, such as chest tightness, shortness of breath, cough, or wheezing. The rescue medications for asthma include albuterol, levalbuterol (Xopenex), and ipratropium (Atrovent). Of these, albuterol is by far the most commonly prescribed rescue medication for asthma. Levalbuterol is the chemical mirror image of albuterol and may have less potential to make patients restless or jittery. Ipratropium has shown to be helpful when used along with albuterol in patients requiring emergency treatment for asthma. It also may be used in patients who are unable to tolerate albuterol or levalbuterol. Many first-line controller and rescue medications are administered through asthma inhalers. Some of these inhalers are called metered-dose inhalers in which the inhaler itself propels the medication into the lungs. Other inhalers are activated by patients taking a breath, and these are called dry powder inhalers or breath-actuated inhalers. Different types of inhalers may work better for different individuals, but both types of inhalers are effective for asthma symptom control if used correctly. Nebulizers are machines that allow asthma medications to be delivered in an aerosolized form, and the medications are then inhaled through a mouthpiece or mask. Nebulizers are often used for children who are unable to perform the proper technique required for inhalers. Some asthma medications are also available as pills. There are currently two injectable medications for asthma (omalizumab [Xolair] and mepolizumab [Nucala] see below), and these are administered in a health-care setting only. There is also an intravenous medication for asthma (reslizumab [Cinqair]; see below). Within the near future, there will likely be additional asthma medications that can be administered either by injection or intravenously. The first-line controller medications for asthma based on the Expert Panel Report (EPR-3) asthma guidelines from the National Heart, Blood, and Lung Institute (NHLBI) are inhaled corticosteroids. These medications are delivered either through inhaler devices or a nebulizer and help to control inflammation in the lungs due to asthma, thus improving symptoms and decreasing the risk of exacerbations. Inhaled corticosteroids by both generic and brand names include fluticasone (Flovent and Arnuity Ellipta), budesonide (Pulmicort), beclomethasone (Qvar), mometasone (Asmanex), and ciclesonide (Alvesco). Combination controller medications exist for patients whose asthma symptoms are not well controlled on inhaled corticosteroids alone. These medications have a long-acting beta-agonist (formoterol, salmeterol, or vilanterol, which are medications that helps to open the airways [bronchodilate]), in addition to the inhaled corticosteroids. The combination controller medications include fluticasone/salmeterol (Advair), budesonide/formoterol (Symbicort), mometasone/formoterol (Dulera), and fluticasone/vilanterol (Breo). These medications are available for delivery by inhaler. A class of oral medications for asthma is the leukotriene modifiers, which act on an immune pathway in the body (the leukotriene pathway) that is responsible for inflammation. This group of medications includes montelukast (Singulair), zafirlukast (Accolate), and zileuton (Zyflo). These medications may be used alone in milder asthma but are often used along with inhaled corticosteroids in moderate to severe asthma. There is a different type of inhaled medication called tiotropium (Spiriva) that may be used for asthma patients, usually together with inhaled corticosteroids. This medication may be indicated for patients who need a combination therapy but who are unable to tolerate the long-acting beta-agonists. This medication also may be appropriate for patients who have a history of asthma but who also have a history of smoking-related lung disease (chronic obstructive pulmonary disease). Tiotropium also may help to further improve symptoms in patients whose asthma is not well controlled on a combination inhaled corticosteroid/long-acting beta-agonist medication. Another oral medication for asthma is called theophylline (Respbid, Slo-Bid, Theo-24). This is an older asthma medication that is not used as frequently today as in the past. This medication acts to open the airways (bronchodilate) and also improves inflammation in the lung due to immune cells activated in asthma. Theophylline is usually used in combination with other asthma medications. Its use is often limited by potential side effects that are not a concern with other asthma medications. Cromolyn is an asthma medication that is only available in the United States for delivery via a nebulizer. Cromolyn is suggested as an alternative medication to inhaled corticosteroids for asthma control, usually in mild asthma. It is not a commonly used asthma medication. There is also an injectable medication approved for allergic asthma, called omalizumab (Xolair) or anti-IgE therapy. This medication binds to the antibody type responsible for allergic reactions (immunoglobulin E or IgE) in the bloodstream and is indicated for severe, allergic asthma not controlled with any of the other available asthma medications. This medication must always be administered in a health-care setting. Recently, two medications have been approved that bind to a chemical messenger in the body, called interleukin 5 (IL-5). Mepolizumab (Nucala) is administered subcutaneously, and reslizumab (Cinqair) is administered intravenously. IL-5 promotes activation and development of eosinophils, a type of white blood cell that is known to contribute to asthma in certain patients. These medications are indicated in patients with asthma not controlled by first line medications who also have an elevated eosinophil count in their blood. Oral steroids, such as prednisone (Deltasone, Liquid Pred), prednisolone (Flo-Pred, Pediapred, Orapred, Orapred ODT), methylprednisolone (Medrol, Depo-Medrol, Solu-Medrol), and dexamethasone (DexPak), are often used during asthma flares to provide prompt relief for asthmatic patients. Although very effective, these medications have many side effects and are only used when absolutely necessary. Some patients with severe asthma, however, may require oral steroids frequently or even on a daily basis. Short-acting bronchodilators provide quick relief and can be used in conjunction for exercise-induced symptoms. Albuterol (Proventil, Ventolin, ProAir, Maxair, Xopenex) is a short-acting bronchodilator. Inhaled steroids are first-line anti-inflammatory therapy. Examples of these medications include budesonide (Pulmicort), fluticasone (Flovent), beclomethasone (Qvar), mometasone (Asmanex), and ciclesonide (Alvesco). Long-acting bronchodilators can be added to inhaled corticosteroids. These should never be used alone for the treatment of asthma. Salmeterol and formoterol are in this class. Leukotriene modifiers can also serve as anti-inflammatory agents. These medications include montelukast (Singulair), zafirlukast (Accolate), and zileuton (Zyflo). Anticholinergic agents can help decrease sputum production. Examples of these medications include ipratropium (Atrovent) and tiotropium (Spiriva). Anti-IgE can be used in moderate to severe allergic asthma. Omalizumab (Xolair) is an anti-IgE medication. Anti-IL-5 agents can be used in moderate to severe asthma with elevated eosinophils. These include mepolizumab (Nucala) and reslizumab (Cinqair). Chromones stabilize mast cells (allergic cells) but are rarely used in clinical practice. Cromolyn and nedocromil (Alocril) are in this drug class. Theophylline (Respbid, Slo-Bid, Theo-24) also helps with bronchodilation (opening the airways) but again is rarely used in clinical practice due to an unfavorable side effect profile. Oral steroids are potent anti-inflammatory agents that are routinely used to treat asthma exacerbations but pose numerous unwanted side effects if used repeatedly or chronically. Prednisone (Deltasone, Liquid Pred), prednisolone (Flo-Pred, Pediapred, Orapred, Orapred ODT), methylprednisolone (Medrol, Depo-Medrol, Solu-Medrol), and dexamethasone (DexPak) are medications in this class. Numerous new medications are being studied, but none are currently commercially available for routine therapy of asthma. All asthma medications require a prescription since patients with asthma should be followed regularly by a health-care professional. There are currently no OTC asthma medications that are recommended for use in asthma treatment guidelines. The asthma medication guidelines classify asthma into different categories based on asthma symptoms during the day, asthma symptoms during the nighttime, use of rescue medications, impact of asthma on daily life, use of oral steroids, and breathing tests done in medical offices (spirometry). The asthma classifications include mild intermittent asthma, mild persistent asthma, moderate persistent asthma, and severe persistent asthma. Patients classified as having mild intermittent asthma generally only require short-acting rescue medications. Mild persistent asthma is treated with inhaled corticosteroids as recommended first-line therapy, with a leukotriene modifier, theophylline, or cromolyn as alternative therapies to the inhaled corticosteroids. Patients with moderate persistent asthma are usually treated with an inhaled corticosteroid/long-acting beta-agonist, a higher dose of inhaled corticosteroid, or an inhaled steroid plus a leukotriene modifier or possibly theophylline. Patients with severe persistent asthma are treated with the higher doses of inhaled corticosteroids plus the long-acting beta-agonists, leukotriene modifiers, possibly theophylline, possibly tiotropium, and possibly anti-IgE or anti IL-5 therapy. Patients with difficult-to-control asthma often end up on multiple types of medications, and some may require oral steroids to maintain control. Common side effects of short-acting asthma medications (albuterol, levalbuterol) are a feeling of jitteriness, tremors, and/or heart palpitations. Hyperactivity can also occur, particularly in children. The two most common side effects of inhaled corticosteroids are hoarseness or thrush, which is an overgrowth of yeast in the mouth. It is therefore recommended that patients using inhaled corticosteroids rinse their mouth after use. These side effects can also be minimized with proper inhaler technique. There is often concern about potential long-term side effects for inhaled corticosteroids. 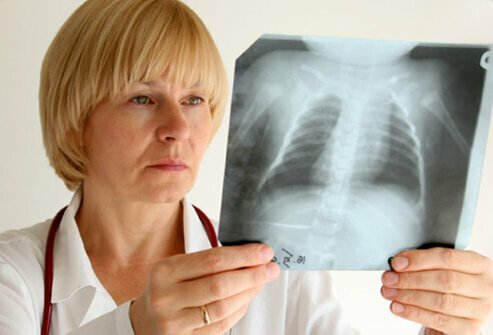 Numerous studies have repeatedly shown that even long-term use of inhaled corticosteroids has very few, if any, sustained significant side effects, including changes in bone health, decreased growth, or weight gain. However, the goal always remains to treat all individuals with the least amount of medication that is effective. Patients with asthma should be routinely reassessed for any appropriate changes to their medical regimen. Although uncommon, the combination asthma medications may also cause palpitations or a sense of jitteriness due to the long-acting beta-agonists. Montelukast, the leukotriene modifier medication, may cause mood changes or sleep disturbance, particularly in children. Zileuton may cause liver inflammation, so health-care professionals should periodically monitor liver blood tests. Omalizumab is generally a well-tolerated medication. Patients may experience some local irritation at the injection site. There is also a warning about the possibility of severe allergic reaction (anaphylaxis) occurring with use of omalizumab. It is recommended that patients on this medication have injectable epinephrine to use in the rare case this occurs. Omalizumab should also always be administered in a health-care facility. Mepolizumab and reslizumab are also generally well-tolerated medications. Patients may experience irritation at the injection or infusion site. Tiotropium may cause dry mouth or irritation of the throat. Theophylline may cause a sense of restlessness. 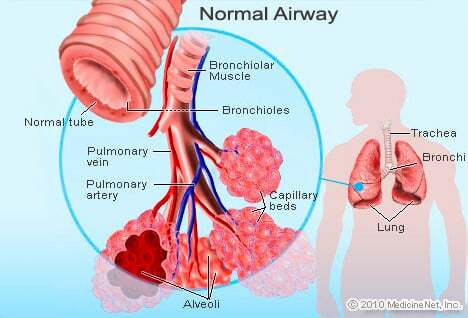 It also can interact with other non-asthma medications so its use requires regular monitoring of blood levels. Short-acting beta-agonists (albuterol and levalbuterol) are used as rescue medications in children and toddlers. These may be used via an inhaler with a spacer and face mask in younger children and via inhaler in older children. These medications are also available in nebulized form, which may be easier to use in infants and toddlers. Inhaled corticosteroids are the mainstay for daily controller medications in children and toddlers. The choice of which inhaled corticosteroid often comes down to which medication delivery device is preferred by caretakers. Young children can use metered-dose inhalers with a spacer and face mask, as long as caregivers are trained and feel comfortable with the proper technique. Budesonide is available via nebulizer, and this may be easier for infants and younger toddlers. Some children may also feel comfortable with a dry powder inhaler. If used properly, all medication delivery devices are effective, so choice is usually individualized based on caregiver and child preference. Combination inhalers are also used in children, and health-care professionals caring for children with asthma may choose these for children with moderate to severe asthma. The leukotriene modifier medications are also used in children. Montelukast is available in granules that can be sprinkled on food and is approved for infants as young as 6 months of age. It is also available in chewable form. Zafirlukast is available for children 5 years old and up. Zileuton is recommended for children 12 years old and up. Omalizumab may be used in children 6 years old and up with poorly controlled asthma and evidence of allergic sensitization. About one-third of pregnant women with asthma experience improvement of the condition during pregnancy, one-third have worsening of asthma symptoms during pregnancy, and one-third stay the same, so asthma control and resulting asthma medication use during pregnancy should be closely monitored. It is generally accepted that the risk of uncontrolled asthma in pregnancy carries more of a risk to the mother and fetus than the use of any of the asthma medications. Therefore, any of the asthma medications can be used in pregnancy if thought to be appropriate by the health-care professional. Of all the asthma medications, montelukast, zafirlukast, budesonide, cromolyn, and omalizumab have been best studied to be the safest in pregnancy. Global Initiative for Asthma. "Global Strategy for Asthma Management and Prevention." 2016. <http://ginasthma.org/wp-content/uploads/2016/04/GINA-2016-main-report_tracked.pdf>. Please describe your experience with asthma medications. Discuss your experience using inhalers, nebulizers, and other types of asthma medication. Do you have experience with over-the-counter asthma medications? Does your toddler need asthma medication? How do you administer it? Do you have side effects from your asthma medications? Do you live in one of the 10 worst cites for asthma? There is no such thing as an asthma-free city, but some are more difficult than others for people with asthma to live in, according to the Asthma and Allergy Foundation of America.